When a woman goes missing in a spring snowstorm and is found dead in a bear’s den, Sheriff Martha Ettinger reunites with her once-again lover Sean Stranahan to investigate. In a pannier of the dead woman’s horse, they find a wallet of old trout flies, the leather engraved with the initials EH. Only a few days before, Patrick Willoughby, the president of the Madison River Liars and Fly Tiers Club, had been approached by a man selling fishing gear that he claimed once belonged to Ernest Hemingway. A coincidence? Sean doesn’t think so, and he soon finds himself on the trail of a stolen trunk rumored to contain not only the famous writer’s valuable fly fishing gear but priceless pages of unpublished work. The investigation will take Sean through extraordinary chapters in Hemingway’s life. 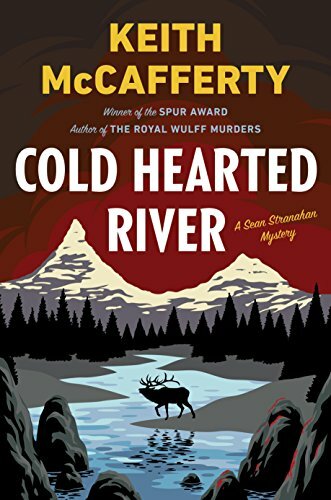 Inspired by a true story, Cold Hearted River is a thrilling adventure, moving from Montana to Michigan, where a woman grapples with the secrets in her heart, to a cabin in Wyoming under the Froze To Death Plateau, and finally to the ruins in Havana, where an old man struggles to complete his life’s mission one true sentence at a time. Again the author draws on history for the theme of this story. Apparently Ernest Hemingway was quite the fisherman and had a trunk of tackle go missing when traveling West. When a wallet of fishing flies with EH engraved on it is found near a suspicious death and the president of the Madison River Liars and Fly Tiers Club is contacted about fishing gear said to belong to Hemingway Sean seems to think the events are connected. He is then hired to track down the items rumored to belong to the author. This takes him not only around the Montana/Wyoming area but all the way to Michigan and beyond. All to find the truth. I love these characters, they are very believable and have become like dear friends. Sean and Martha have found their way back to each other which doesn’t make his former girlfriend very happy. I think the relationship may continue to be in flux as they are both very independent people, with Martha being very opinionated and strong willed while Sean seems to go with the flow. I love their dialogue with each other. I am anxious to see their story pan out. The book starts with a heart-wrenching telling of 2 people trapped in a storm that brings a search party out. I was captivated immediately. I really enjoyed this story and the way Mr. McCafferty weaves Hemingway’s history right into this current day story. It takes many twists and turns as each new clue is uncovered. I do love the way this author writes, his laid back style, he is a very descriptive writer. This time I felt we were covering the same places more than once with the same details so it dragged just a little bit for me in places but enough to ever stop reading. I was totally taken by surprise at the ending. Hook, Line, and Sinker, put me in the net. The last twist, priceless. I was right there with Martha as Sean told her what happened. A mystery, some history, drama, and romance makes this an enjoyable escape. Thank you for hosting Keith McCafferty and his latest book on your blog. Somehow I have failed to try any of his books so I’ve added Mr. McCafferty to new authors to check out. I love all things Hemmingway, so adding a connection to him in a modern day mystery sounds intriguing. As someone who has lived in CO for the past 30 years, I also love stories set in the West. Sounds like I have another author & series to read. “A mystery, some history, drama, and romance…..” and I want to read it, too!